Removing chemical, biological, radiological, and toxic contaminants from a range of surface types could be as easy as peeling off a sticker thanks to research conducted by scientists at the Edgewood Chemical Biological Center (ECBC) and industry partner CBI Polymer. Jointly, ECBC and CBI Polymer researchers explored how a HydroGel can be modified to decontaminate surfaces contaminated with biological agents such as spores of Bacillus anthracis, which are capable of causing anthrax disease in humans and animals. HydroGel is a biosynthetic polymer that can be sprayed, painted or poured on a surface. HydroGel then dries into a film, which can be peeled away and disposed of with little to no threat to the environment or the operators. The peeled gel does not generate any water waste and traps any toxic contaminant, such as biological spores, which removes the threat of the agent reaerosolizing. Conventional decontamination methods involve spraying soapy water and liquid sporicidal agents, which generates a high volume of wastewater that could flow into drains and be added to the environment or be otherwise difficult to safely collect and dispose of. These methods also pose a threat to the operators if residual waste gets sprayed on them. CBI Polymer created HydroGel to remove toxic material from hard surfaces in an industrial setting. 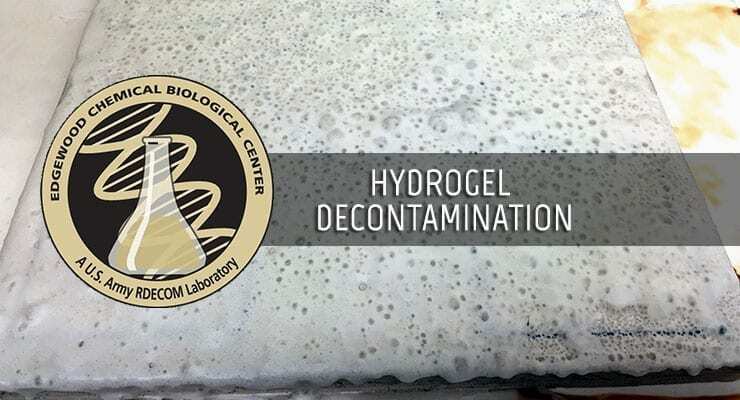 The ease of use, safety and significantly reduced burden to the environment caused ECBC scientists to explore if HydroGel could be applicable as a sampling tool for biological contaminants on surfaces. In 2013, ECBC entered a Cooperative Research and Development Agreement (CRADA) with CBI Polymers to create modified HydroGel formulas that could decontaminate biological spores. Led by senior research biologist Vipin Rastogi, Ph.D., ECBC researchers developed two advanced formulas, called DeconGel, that can successfully decontaminate multiple surfaces of biological agent. The Department of Homeland Security Science and Technology Directorate (DHS S&T) was researching how to decontaminate a subterranean environment such as a subway station, if contaminated by virulent biological spores. Rastogi and Garry Edgington, Ph.D., Chief Scientist and Vice President for Research and Development at CBI Polymers, felt that DeconGel could be a great solution for that situation. Donald Bansleben, a DHS S&T Program Manager, sponsored the collaboration between CBIP/Metis and ECBC for the subway application. Rastogi and his team conducted research that proved that DeconGel could remove biological spores from four surfaces commonly found in subways: steel, aluminum, concrete and tile. Bansleben feels that DeconGel could be helpful in decontamination efforts. “A universal decontaminant does not exist, but DeconGel can be another tool in the toolkit for remediation of biological agent contamination,” he said. Lisa Smith, an ECBC research biologist, and Rastogi were very curious to see if HydroGel had any potential for biological sampling applications in its original unmodified form. As a part of an internal ECBC basic research program, Smith and Rastogi used the base HydroGel as a potential tool to collect biological agent from porous and non-porous surfaces. The difference between this HydroGel and the DeconGel use is that in DeconGel, the formulation kills the spores as gel dries into a film. Encapsulation of the spores in HydroGel allows the spores to remain intact for forensics analysis. “The answer is yes, it is very successful,” Rastogi said. HydroGel used in this way protects the sample better. While wipes and swabs are proven, successful methods, they tend to interfere with the sample by spreading it around, or at times it may not pull enough sample from the surface to enable precise contamination assessment and testing. ECBC is in the process of initiating a new inter-agency agreement with the Environmental Protection Agency’s National Homeland Security Research Center in North Carolina to compare the cost and effectiveness of sporicidal chemicals when applied as liquids, gels, and foams and predict the best option for rapid decontamination of large surfaces in the event of a bioterrorism release. This joint program will likely start in the third quarter of FY 2016, and is a shining example of long-standing on-going partnership between the two federal agencies, which began over ten years ago in 2004. Article courtesy of ECBC Public Affairs, adapted for context and format by Global Biodefense.